A 25 year old young man presented to Dr Lekich with his partner of 3 years. Within 6 months of starting their relationship he had undergone a vasectomy procedure at the age of 22 at another clinic. The patient and his partner presented to Dr Lekich to discuss a vasectomy reversal, and both were emotionally distraught. Dr Lekich performed a complex bypass epididymovasostomy (BEV) microsurgery on a 38-year-old male patient who presented to Dr Lekich, after being told by IVF doctors and a urologist that he had a zero sperm count without any obvious cause. 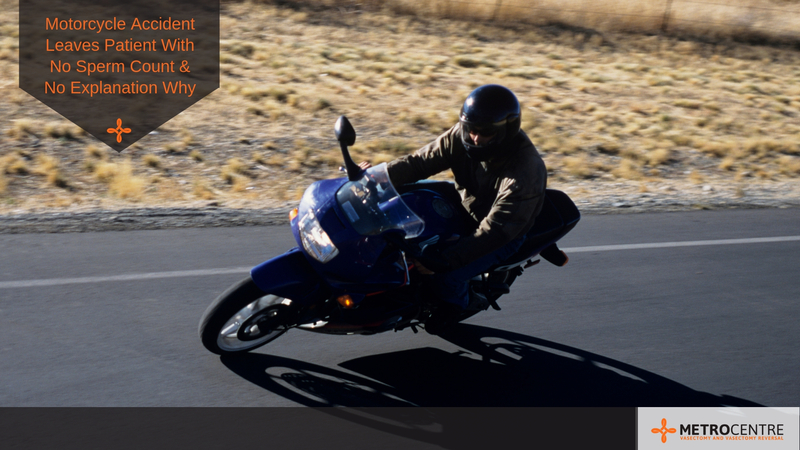 Seven years earlier he had a motorcycle accident with severe trauma to his scrotum. 16 years ago, Benno had a simple vasectomy performed with a GP after having two children from a previous relationship. 8 years later he decided that he would like to grow his family and to have a Microsurgical Vasectomy Reversal (performed by Dr Lekich). Now that his family is complete, Benno has elected to undergo another vasectomy - the Metrocentre way, performed by Dr Lekich. A 25 year old young man presented to Dr Lekich with his partner of 3 years. Within 6 months of starting their relationship he had undergone a vasectomy procedure at the age of 22 at another clinic. The patient and his partner presented to Dr Lekich to discuss a vasectomy reversal and both were emotionally distraught. For the last two and a half years they considered this the worst decision of their lives. The pair sadly described the original vasectomy consultation as lasting only 5 minutes in length and they regret not having had counselling prior to their original vasectomy. Not all couples need counselling before undergoing a procedure, however, it is important for the Doctor to feel reassured that the couple have had adequate emotional preparation in their decision making, especially when they are so young and have not already had any children. 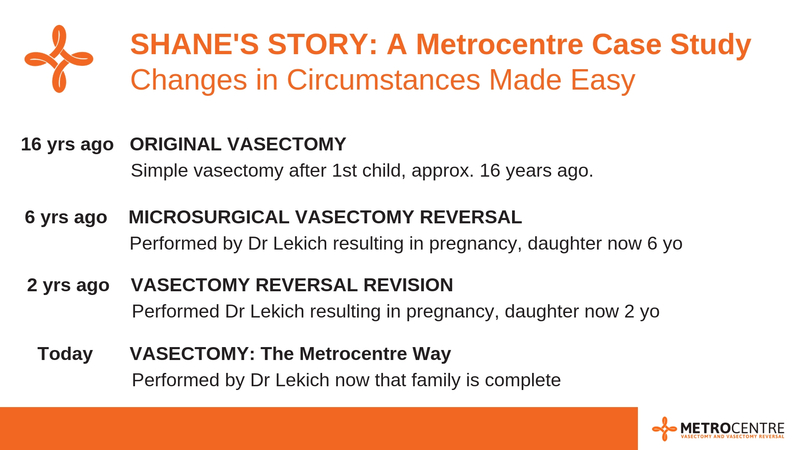 Change of circumstances is another reason why The Metrocetnre Vasectomy is a great option for patients, being the most reversible vasectomy and offering the most desirable outcome should life circumstances and decisions change. This 25 year old patient has recently undergone a microsurgical vasectomy reversal procedure with Dr Lekich. Last month we received test results to say that his sperm count has returned to normal and the couple can now start trying for a family. A male patient presented at the age of 38 to Dr Lekich, after being told by IVF doctors and a urologist that he had a zero sperm count without any obvious cause. Seven years earlier he had a motorcycle accident with severe trauma to his scrotum. Following an ultrasound scan of the scrotum at the first consultation, Dr Lekich could see evidence of damage to his epididymis on both the right and left testicles. The epididymis are the fine collecting tubules of sperm coming off the testicle. After a full discussion of the ultrasound findings and the very complex bypass micro surgery technique, which is possible through the pioneering work of Professor Earl Owen, the patient proceeded to day surgery with Dr Lekich in April of 2012. Sperm counts consistently increased and the patient was still advised by an IVF clinic they could not fall pregnant. The patient fathered a child naturally with another partner six years later notifying Dr Lekich with a baby photo as promised.